Guide for the hero Wukong, a character in Arena of Valor (AoV). Included are Wukong’s abilities, statistics, attributes, strengths, weaknesses, and more. 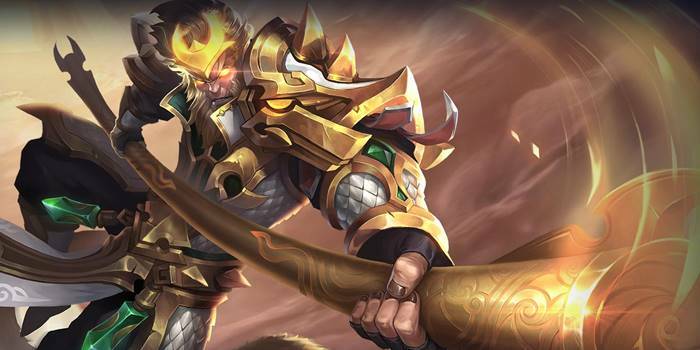 These are Wukong’s attributes on the mobile version of Arena of Valor. Click here for his attributes on the Nintendo Switch version. Each time Wukong uses an ability, his next normal attack is enhanced and deals an additional 330 (+14 per level) (+1.0 AD)ˀ physical damage Wukong also tumbles toward the target. Wukong’s staff grants 15% critical chance permanently. The additional damage increases by 14 each time Wukong levels up (this isn’t currently included in the game description). The resulting damage on crit is 2x the sum of the additional damage from the enhanced normal attack (330 at level 1) and the AD multiplier (+1.0 AD). The crit chance is only applied to normal attacks. Wukong temporarily disappears and gains 40% movement speed for 1 second. Wukong tumbles towards the specified direction, gaining 100/120/140/160/180/200 armor and magic defense for 3 seconds. Wukong unleashes the inner Chi, dealing 150/190/230 (+0.5 AD) physical damage and stunning them for 1 second. It can be used again within 5 seconds, to make Wukong disappear and increase his movement speed by 40% for 1 second. Remember to hit enemies with a normal attack after using an ability to properly utilize the additional damage from Wukong’s passive. Follow this with another ability immediately to continue the combo. If any of these hits are critical, it will deal a ton of damage. Our recommended order for Wukong abilities as he levels up. See all of Wukong’s item builds. does monkey business’ second cast triggers god of war?